Now that stocks have started to sell off and interest rates have begun to rise, many investors are again looking for great stocks at bargain prices, and those in Warren Buffett's Berkshire Hathaway (BRK.A) portfolio are a great place to start your search for long-term value. 24/7 Wall St. pulled out the "cheapest" stocks from Berkshire's stock holdings to see where the best opportunities are for long-term investors today. Buffett is of course a value investor who seeks growth at a reasonable price, and he generally prefers companies that pay a dividend. Their screens focused primarily on stocks that had the most upside to the Thomson Reuters consensus price targets from Wall Street, but looked at at other valuation metrics as well. What is amazing is the many companies in the Berkshire portfolio that are trading near what the analyst community would call fair value. But Investors should remember that Buffett himself is less interested in how Wall Street values stocks in the short term. He puts his money into solid companies that he knows will remain attractive through good times and bad. (DE) trades at close to $86, and the $97.89 consensus price target implies upside of almost 14%. Deere comes with a 2.3% dividend yield. The 4 million shares in Buffett's war chest are worth about $344 million, but will be worth almost $400 million or so if you include the dividends in a year, if Wall Street is right. Buffett might agree with the most optimistic analyst target out there of $120 per share, since this machinery giant trades at only about 10 times earnings. GM (GM) is still a fairly new position for Team Buffett. Buffett probably thought he would get an index-related bounce, and his 25 million share are worth about $850 million. GM's stock has risen to more than $34, which still leaves more than 15% upside to the consensus price target of $39.53. Buffett likely foresees years of auto sales growth ahead, and GM's forward earnings multiple of 10 times earnings is just a tad cheaper than the dividend-paying Ford Motor (F) at almost 11 times earnings. The highest analyst target out there is actually above $50, although we would caution that GM pays no dividend. 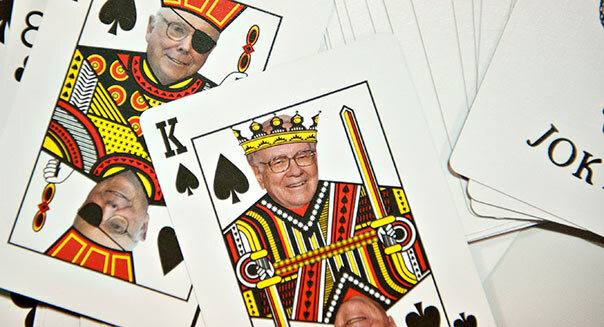 J.P. Morgan (JPM) is a personal stock holding of Buffett, even though Wells Fargo & Co. (WFC) keeps becoming a larger and larger stake for Berkshire Hathaway every quarter. We are not sure how much money Buffett has put into J.P. Morgan himself because it has not been disclosed. With shares just under $53, the implied upside is close to 8% here, and that was the most upside in the Buffett banking and financial giants. Buffett himself likely agrees more with the highest consensus target of $66, since this top bank trades at less than 10 times earnings and yields almost 3%. Coke (KO) has retreated to under $41 from $43 in this latest market pullback, but the implied upside to the $46.20 price target is now about 13.5%. Buffett has been a long-term holder here, and his position is worth close to $16 billion. The top analyst target is $50 and the dividend yield is about 2.8%. Buffett has had a stake in Coca-Cola so long that he likely couldn't care less that a beverage stock trades at about 19 times expected earnings. IBM (IBM) is still somewhat new to the Buffett portfolio, and it's a larger position, worth close to $14 billion, for more than 68 million shares. The $203 share price implies almost 10% upside to the $222 price target. IBM keeps buying back stock at a rapid pace but only pays a 1.8% dividend yield. It trades at about 12 times earnings, and the highest price target from the analyst community is $250. Berkshire Hathaway's position in National Oilwell Varco (NOV) has grown to almost 7.5 million shares, with a current market value of more than $500 million. It trades at about $69.25, and that implies about 19% upside to the $82.58 consensus price target. The dividend yield here is lower than most Buffett stocks at only about 1.5%, but its valuation in the oil infrastructure market is not excessive at about 12 times expected earnings. Buffett's new portfolio managers probably think that the highest analyst price target of about $93 is closer to the truth, considering its dominance oil and gas infrastructure. Buffett's stake in Precision Castparts (PCP) is worth about $420 million, but the $211 share price implies upside of about 13.5% to the consensus $239.60 price target. Its dividend is too small to matter, although it was hard to not notice the street-high price target of $280 for the metal components and products player. Berkshire has a lot riding on it's stake in Procter & Gamble (PG), which is valued at about $4 billion, although this is a lower stake than it had been in the past. Now that shares have pulled back to about $76.85, the implied upside that remains here is just over 10% to the consensus target of $84.78. Buffett likely agrees with the activists that the CEO change may help, and Buffett probably would think that the street-high target price of $95 is perhaps better for the long-term, as the consumer products giant recently tried to break out to higher prices. Buffett might also say that he is happy to get that 3.1% dividend yield while he waits. He might agree that 19 times earnings is too much in general to own a consumer products stock, but he has said over and over again that he'll pay up for quality. Berkshire Hathaway's stake in Phillips 66 (PSX) was added to after the Conoco spin-off, its 27.16 million shares are worth more than $1.7 billion. The $63.75 share price implies upside of more than 13% to the $72.15 share price. Buffett went out of the way to talk up this holding in 2012, and the dividend is about 1.9%. This refiner and marketer trades at only eight times earnings, and the street-high target price is $85. Berkshire has a rather small position in Verisk Analytics (VRSK) -- less than $100 million, making it one of the new portfolio manager's positions. Now that shares are down around $58, this implies about 12% upside to the $65.18 consensus price target. This analytics outfit for financial, insurance and health care decision-making does not pay a dividend, but the highest analyst target is up at $71 here. (USG) is a strange position for Berkshire because the equity value of the stake of more than $400 million is undercounted to the actual control that the company has here. The $24.25 share price has corrected from more than $30, but that means there's a 27% implied upside to the $30.82 consensus price target. The common stock pays no dividend, but there is over 50% implied upside to the street-high $39 price target. The home builder products company still trades at a very high multiple of about 40 times earnings, but this has been a stake for years and years, while shares have been both much higher and much lower. Some of the stocks from the Buffett portfolio have quite a lot of implied upside, and other upside winners are only about at-market upside risks. Stocks have pulled back in recent days and volatility has returned with a vengeance.